It has been hypothesised that farmers in countries that do not adopt GM crops do or will have fewer seed options. By extension, there is concern that the choices made by countries that have so far rejected GM crops have had an impact on their productivity. To estimate how much real world choice maize farmers have in countries with different degrees of GM crop adoption (Austria, Germany, Spain, Switzerland), we used surveys of seed catalogues from local and regional seed suppliers, transnational seed corporations and public national and European seed registration catalogues as an approximation for real world choices available to farmers. We further compiled and analyzed yield data from the UN Food and Agriculture Organisation FAO to compare yields over the same period of time in GM-adopting and non-adopting countries. We found no evidence that restrictions and regulations of GM crops in Europe have decreased seed choices for farmers in the non-adopting countries Austria, Germany and Switzerland. In contrast, we observed that in Spain, which has adopted GM maize, the seed market was more concentrated with fewer differentiated cultivars on offer. In Spain, overall numbers of maize cultivars declined, with an increasing number of non-GM cultivars being replaced by GM cultivars. Moreover, there was no detectable yield advantage in GM-adopting countries, even when we extended our analysis to the United States. In the non-adopting European countries of our analysis, farmers have more maize cultivars available to them today than they had in the 1990s despite restricting GM-varieties. Along with the increasing adoption of GM cultivars in Spain, the studied GM-maize adopting country in Europe, came a decline in farmers’ choices of total numbers of available maize cultivars. In Europe, genetically modified (GM) organisms in food and agriculture production have been a highly controversial issue since their commercial introduction in the mid 1990s [1, 2]. There is little demand among farmers to grow GM varieties, nor is there a demand from consumers for foods derived from GM plants in Europe . One argument often heard in the debate about the commercial release of GM cultivars is that farmers in countries with bans or regulations restricting access to GM crops forego competitive advantages because they have fewer choices. In fact, in 2011 the GM industry tried to launch a large media campaign with the aim to “transform Europe’s position on GM food” that hinged almost entirely on the issue of “choice” (e.g. see EuropaBio)a[4, 5]. In contrast, Roseboro  concluded that in an environment with little to no regulatory restrictions to access of GM crop varieties, like in the US, “market choice to grow GM crops eventually leads to less choice or a choice among GM cultivars only”. Similar observations have been reported in India  and South Africa . Pointing out the limited available research, the US National Research Council  urges for more studies on how increasing market concentration of seed suppliers affects overall yield benefits, crop seed/cultivar diversity, seed prices, and farmer’s planting decisions and options. Thus, it is timely, possible and necessary to evaluate the above described arguments of more or less cultivar choice under different regulatory regimes. We compared the development of available maize seed/cultivars for farmers in countries with little to no access to GM varieties (i.e. non-adopting countries: Austria, Germany and Switzerland) to Spain (i.e. the adopting European country) where farmers have unrestricted access to approved GM maize varieties. We used seed catalogues listing the maize cultivars available to farmers for purchase and public national and European seed registration catalogues as a proxy for “choice” in countries with different adoption status for GM crops. Further, we compared overall maize yields reported for these countries since the mid 1990s to see whether or not the introduction of GM maize lead to noticeable changes and differences in overall yield. We acknowledge that choices among cultivars in national and EU seed catalogues/registrations may not equate to a perfect estimate of genetic diversity. However, we postulate that it is very unlikely that fewer varieties available over time would be a sign of greater genetic diversity in the future or more choice to farmers. The choice for looking into cultivars of maize only at this time was driven by necessity, since it is the only GM crop approved for cultivation in Europe. However, it is also because maize has become an iconic crop when it comes to understanding how our food and feed production system works. Future research may look into the deeper issues underlying cultivar and genetic diversity. We contrasted the results between the only adopting EU country, Spain, and included the US in the discussion, and the non-adopting countries Austria, Germany and Switzerland. Although there has been and still is some production of GM crops in Germany, it was classified as a non-adopting country because most of the GM cultivation is under temporary field trial release permits or otherwise tightly controlled and overall still at a very limited scale. The key sources of data were the seed catalogues of the main maize breeders, distributors and public agricultural departments available in the non-adopting countries listed above. Although we did not have access to seed catalogues for every year in every country, it did allow us to get an overview over the development of the numbers of maize cultivars available to the farmers on the commercial seed market for a significant period of time up to 2011. The companies and organisations listed in the Appendix market essentially all of the maize cultivars in Austria, Germany and Switzerland. There are other sources of seed, but they are very small by comparison. A few small breeders exist that generate seed for niche markets such as specialty polenta maize landraces. The Swiss-based Sativa Rheinau AG (Rheinau) is one such breeding enterprise that develops seeds for organic maize production. Furthermore, small public, non-profit seed conservation and development organisations exist that aim to keep certain endangered cultivars alive and promote their continued use (e.g. “Ribeli” or “Linth” maizeb in Switzerland). The respective national authorities, namely the German “Bundessortenamt” (Hannover), the Swiss “Bundesamt für Landwirtschaft” (BLW, Berne) and the Austrian “Agentur für Gesundheit und Ernährungssicherheit GmbH” (AGES, Vienna), also provided information concerning the national catalogues of varieties. For the yield data extracted from FAOSTAT, we carried out linear regression analyses using Systat and Excel software. Data for Spain were obtained from the European Common Catalogue and the norms published at the Spanish Official Bulletin (Appendix). Moreover, the catalogues of the main seed companies were screened. Additional data were obtained from publications and internet enquiries. For these 3 countries, the seed catalogues of the most important maize breeders and distributors of maize seeds were compared. This allowed insight into the development of the supply side of the seed market. More specifically, for Germany, we used the annual publication of the DMK (Deutsches Maiskommittee) “Sortenspiegel” and for Switzerland, we complemented the information extracted from the maize seed catalogue of the ART (Agroscope Federal Research Station) with the information received from individual breeders (Appendix). For Spanish maize cultivars, we combined the data of nine editions of the “European Common Catalogue” of varieties of agricultural crops published in the Official Journal of the European Union (from April 2003 to December 2011) with the norms published in the Spanish Official Journal (“Boletín Oficial del Estado”) registering or withdrawing maize varieties at the Spanish Register of Seeds from January 1997 to December 2011c (Appendix). Although frequently the varieties registered or withdrawn from the two catalogues coincide, this is not always the case and the difference is especially relevant for many GM varieties that are only registered in the Spanish Catalogue during a certain period of time. For instance, although the first Mon 810 GM varieties were registered in the Spanish Catalogue in 2002, they did not appear in the Common Catalogue until September 2004. It is also important to note that the varieties registered in the Common Catalogue can be used throughout Europe. So, in principle, Spanish farmers can use any maize cultivar registered in another EU country. However, this practice is rare as most farmers use the varieties registered in their country because they are more readily available and better adapted to the local conditions. In search for evidence for whether or not lack of choice of GM cultivars impacted competitiveness of non-adopting countries, we looked a maize yields as proxy. We compiled and compared annual maize yields reported by FAOSTAT for the same time period as we analyzed cultivar numbers/availability (1995–2011). FAOSTAT database is hosted and maintained by the Food and Agriculture Organisation (FAO) of the United Nations4 and provides annual statistics for crops and other agronomic parameters. The data were analyzed by listing the varieties per maize breeder/distributor and per country using Microsoft Excel spreadsheet functions and calculation tools. For in-depth statistical data on yields, we refer to FAO website and databasesd. For Spain, we also classified each variety as “newly registered”, “already registered” or “withdrawn” during the analysed year (comparing it with the previous year), and if they were GM or non-GM cultivars. The data were collected from diverse sources. This caused some inconsistency because the level of detail changed from one source to another. We did not differentiate between cultivars for different uses, early or late varieties and ideal zone of cultivation. Further, we did not compare the absolute numbers of farmer-available cultivars between the individual countries because the agricultural structure, the national legislation for cultivar registration and even some names of varieties differed from country to country. We exclusively compared the overall development and the change of available, registered cultivar numbers within the countries to answer the following questions: i) within a given country, did cultivar numbers decrease, increase or remain the same from the mid 1995 to 2011, ii) where appropriate (i.e. Spain), what change in availability among GM- and non-GM cultivars was observed over that period of time, and lastly, iii) how did the recorded overall yield levels in these countries develop over the same period of time? We used these data to compare observed trends between countries and in the discussion extended the comparison to include the United States (US). Since the commercial introduction of GM varieties in 1996, the global numbers of hectares sown to GM crops has increased . According to the ISAAA, 160 million hectares of GM crops were grown globally in 2011 . These industry-sourced numbers are neither independently verified nor universally accepted as accurate . Nevertheless, there is no denying a significant concentration of GM crop production in particular countries located primarily in North and South America. In the EU, adoption of GM crops has always been very limited. Maize is the only commercial GM crop in Europe. Spain is the only member state where large scale cultivation of GM maize occurs. In the rest of the EU, some GM maize has been grown in Czech Republic (<7000 ha), Portugal, Romania, Poland (3000–5000 ha) and Slovakia (<1000 ha) . In Spain, the commercial cultivation of GM maize started in 1998 with the authorization of two GM cultivars: Compa Cb and Jordi Cb by Ciba Geigy (today Syngenta). These varieties carried the Bt 176 transgene and were withdrawn in 2005, following an EFSA recommendation . Varieties with the event Mon810 were registered in 2002. The area sown to GM maize in Spain has increased to 97'000 ha or 26.5% of the total maize surface in 2011 . The highest adoption rates for Bt maize are found in the Northeast of Spain, with 54% and 72% of the total maize surface in Aragon and Catalonia, respectively, in 2010. By December 2011, 108 GM maize cultivars were registered for cultivation in Spain. In the following, we will present the results from individual countries. The number of commercially offered GM maize cultivars in Spain increased from only two varieties in 1998 to 108 by the end of 2011 (representing 42% of the total 255 cultivars on offer) (Figure 1). Simultaneously, the number of non-GM cultivars decreased about 64%, from 408 down to 148, over the same time period. There were 38% fewer total maize cultivars on sale in 2011 compared to 1998. The highest decline, both for all cultivars and non-GM cultivar, was registered in 2004, as 146 varieties were withdrawn from the registers (only one was a GM cultivar, which had been registered some months before) (Figure 1; see also Figure 2). This stands in contrast to the overall development in the EU (Figure 3a), especially in Germany (Figure 3b). Cultivars available to farmers in Spain (1997 – 2011). 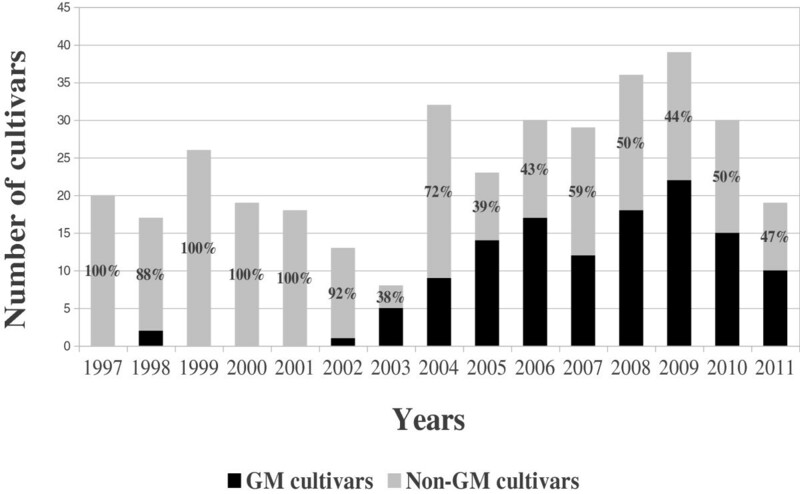 Number and percentage of GM and non-GM cultivars of all removed maize varieties per year (1997–2011). Total numbers of maize cultivars registered in EU common catalogue (a) and in individual study countries (b). Two periods can be distinguished for Spain in the years 1997–2011. Between 1997 and 2002 only 2 of the total of 131 newly registered varieties were GM, and these were both registered in 1998 (there was a third one registered in 2002 but withdrawn some months later of the same year). Between 2003 and 2011, 122 of the 246 newly registered varieties were GM (an average of 49%). The highest percentage of new GM-cultivars was registered in 2003 and 2005 when over 60% of all new maize cultivars were GM (Figure 4). Almost none of the cultivars that were withdrawn from the catalogues over the whole period were GM (Figure 2). Number and percentage of GM and non-GM cultivars of all newly registered maize varieties per year (1997–2011). An important aspect regarding seed availability in Spain is that maize production is regionally heterogenous, with the highest concentration in the North-east of Spain (mainly Catalonia and Aragon), where most GM maize is grown (73% of the total GM maize cultivated in Spain). Seed availability depends on the local market, as farmers mostly buy their seeds in their trading cooperatives, and not directly from the seed companies . Trading cooperativese concentrate 95% of the Spanish maize production, and run the majority of the collection points and drying centers [15, 16] sometimes vertically integrating the entire production chain from seed to meat production. This means that cooperatives sell the inputs (seeds, fertilizers, pesticides) and also function as collection points (elevators), drying centers and storage facilities. They market the harvest and sometimes they also manufacture the feed. Often they also grant credits and lease the machinery to the farmers during the season. The cooperatives also provide technical assistance to the farmers, becoming a key actor for the extension services and the introduction of new technologies . This concentration of infrastructure and management above the farm level makes it difficult and expensive to separate GM from conventional production during the production chain. As the price for GM and conventional maize is the same, the final product for feed production is labelled as GM. 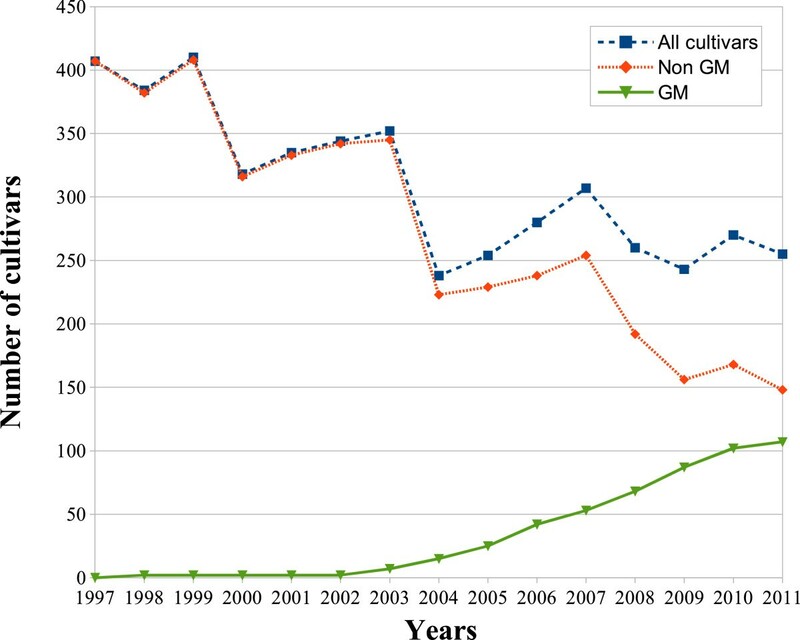 As a consequence, there is no incentive for growing non-GM varieties, and minority products (such as organic or speciality maize) tend to decline or disappear in areas with high adoption of GM crops . In the EU, the number of maize cultivars on offer increased, in particular since 2003, largely as a result of the integrated market development under the EU frameworks. In 2003, 3197 cultivars were registered in the EU. Until 2011, registered European maize cultivars increased by about one third up to over 4500 cultivars (Figure 3a). Among the non-adopting countries, the numbers of maize cultivars available to farmers increased most steeply in Germany as compared to Austria and Switzerland (Figure 3b). Maize cultivar numbers increased from 116 varieties in 1994 to around 320 varieties in 2011. Between 1998 and 2003 (for the years 2001 and 2002 no seed catalogue records could be obtained), the number of offered maize cultivars for farmers almost doubled (from about 163 to 289) (Figure 3b). Interestingly, the transnational corporation Monsanto (the prime global GM cultivar selling corporation) tended to offer similar and comparatively fewer numbers of maize cultivars. Syngenta, another transnational seed corporation increased its cultivar numbers only over the past few years (Figure 5). However, among the top three seed selling companies, two are locally-based (RAGT Saaten and KWS) multinationals (Figure 5). Total numbers of cultivars sold in Germany by the major seed companies. The total number of maize cultivars offered over time also increased in Austria, but was subject to larger fluctuations than in Germany. In Austria, there was an overall increase from a total of 19 varieties in 1995 to around 75 in recent years (Figure 3b). This was sustained by the fairly steady increase of offered cultivars by, again, the more locally based seed organisations “Saatbau Linz” and “RAGT Saaten Österreich AG” (Figure 6). Pioneer significantly decreased the number of cultivars on offer in 2002. Only in 2010 did Pioneer offer similar numbers of cultivars as they had a decade before (Figure 6). However, the Austrian data set was not as exhaustive as the one for Germany or Switzerland. Total numbers of cultivars sold in Austria by the major seed companies. In Switzerland, the number of offered total maize cultivars was stable over time (Figure 3b). The sector tries to keep the offered range of seeds manageable and within 60–80 varietiesf. In general, similar numbers of cultivars were offered by each seed organisation (Figure 7). With the exception of “Fenaco Genossenschaft”, all other companies have increased the number of cultivars that they offer in recent years. “DSP Delley Samen und Pflanzen AG” increased numbers until 2009 after which numbers dropped steeply while those of “Swiss Granum/ART” rose steeply (Figure 7). Total numbers of cultivars sold in Switzerland by the major seed companies. The three analysed non-adopting European countries appear to have maintained their productivity since the mid 1990s (Figure 8). Across all countries examined, there has been an overall increase in yields from around 80’000 hg/ha in the mid 1990s to 100'000 hg/ha today. Yield comparisons between selected ecosystems represented by the US and Spain on the one hand and the non-adopting countries Austria, Germany and Switzerland on the other indicates that the use of GM varieties has not been the dominant determinant of yield productivity (yield increment per year ranges from 1165 hg/ha in Spain, 1430 hg/ha in USA and 1530 hg/ha in the selected non-adopting countries represented as “Europe” in the Figure 8). In fact, Austria (a strict non-adopter of GM crops) reported record maize yields of >180 Hg/ha that no other countries came close to match (Table 1). Yield development in maize production per hectare from 1995–2011 in USA (red dashed line, filled circles), ‘Europe’ (green dotted line, crosses), and Spain (purple solid line, filled squares, as a GM-adopting country). (Linear regression analysis of yields per year: USA: y = 1430x + 77493; R2 = 0.732; p<0.001; “Europe”: y = 1530x + 82521; R2 = 0.412; p=0.005; Spain: y = 1165x + 85512; R2 = 0.63; p<0.001). 1 Hectograms/hectare. Range of GM area is from 4% to 85% and proportions taken from GMO Compass or USDA*, or from acreage reported on GMO Compass and total acreage for corresponding year from FAOSTAT (http://faostat3.fao.org/home/index.html#DOWNLOAD). 2 Ratio is (average yield in USA)/(average yield of country in corresponding row). 3 Proportions of GM cultivation in maize only reported in 1998, 2005–2011. 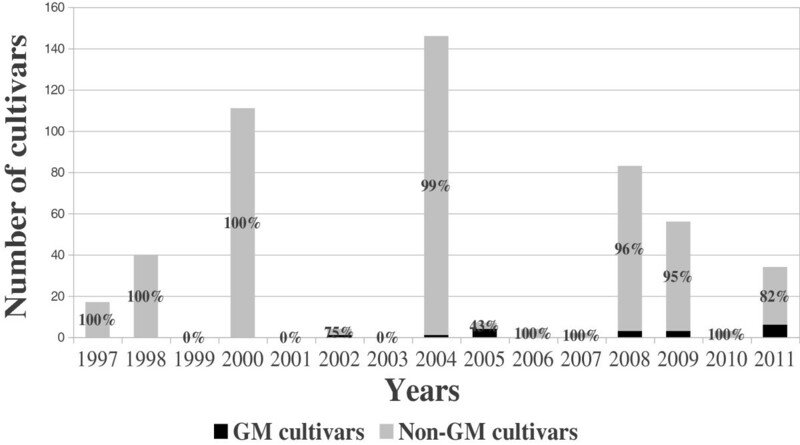 Intervening years had GM cultivation. Further, yield variations from year to year may be indicating an increasing vulnerability to weather extremes. In the past decade, European and US agriculture has have been struggling with changing rainfall and erratic temperature patterns, causing two of the most dramatic yield drops in recent history in Europe, the droughts of 2003 [18, 19] and, to a lesser extent, 2005/06g, and in the US, the droughts of 2011 and 2012. According to the USDA, in 2011 maize yields dropped to 92366 hg/ha. Due to the drought that hit the US in 2012, it is expected that maize yields will again be comparatively low for that year. For in depth statistics on yield data, we refer to the relevant FAO website and databases. 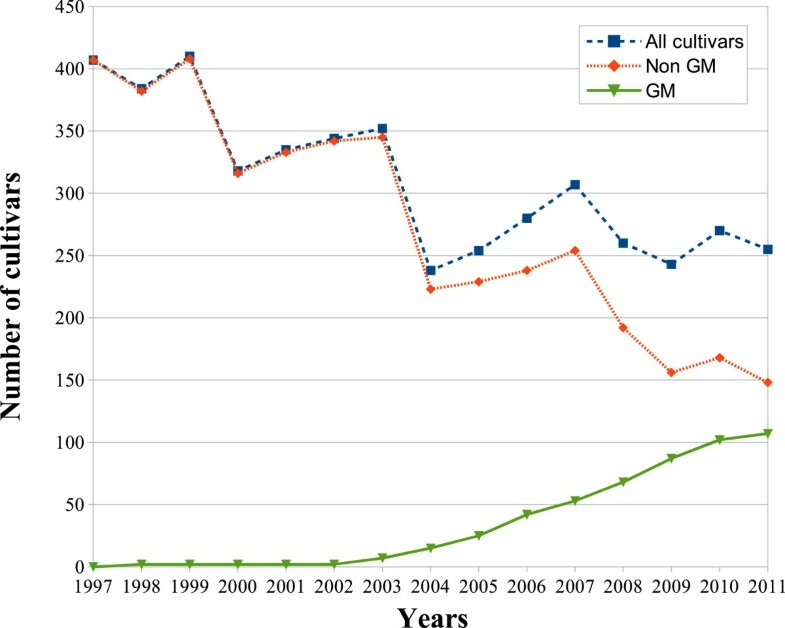 Our analyses revealed no evidence in support of the claim that farmers living in European countries with no or highly regulated access to GM crops experience declining seed options and forego competitive advantages in terms of yields since the mid 1990s when GM varieties were introduced to other markets. 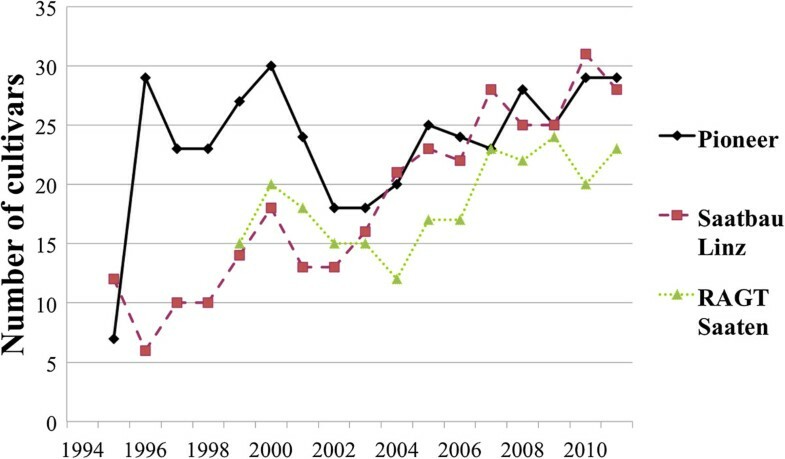 In particular in Germany, the situation changed in a surprisingly positive way towards a remarkable increase in choice of maize cultivars offered since the mid-1990s. Also in Austria, an increase in cultivar choices was observed, while in Switzerland the situation remained similar over the period monitored. In summary, it can be safely concluded that in the three studied non-adoption countries, farmers have more maize cultivars available to them today than they had in the 1990s despite restricting GM maize, while in Spain, the only GM adopting country, overall numbers of cultivars to choose from for a farmer have declined and increasingly have become a choice among GM cultivars. Since 2003, every year on average roughly 49% of the new maize cultivars are GM and nearly all of the removed maize varieties are non-GM, conventional varieties. With this, the development in Spain seems to follow that in the US where cultivar choices today exist practically only among substantially fewer GM varieties ( and see below). However, it was quite challenging to compile the necessary empirical database for our analyses from seed catalogues and national registrars that differ substantially in set-up from country to country. A more uniform and standardized registration of commercially available cultivars per year and country at least across Europe would be necessary to support the monitoring of the development of cultivar availability over time - and, thus, likely of cultivar diversity. Interestingly though, over the same period of time, yields in non-adopting European countries seem to have stayed competitive with yields in GM adopting countries, with European maize yields having been regularly as high or higher than in the US, except in severe drought years. Although the US had adopted GM maize at a large scale already by the late 1990s, this choice was not sufficient to raise yields above those achievable in Western Europe, a selection of countries with equal access to all other agri-biotechnologies, mechanization and advanced germplasm. This conclusion is in agreement with those by the Union of Concerned Scientists (UCS) who published an extensive analysis of the impact of GM crops on intrinsic (potential) and operational (real-world) yields . Intrinsic or potential yield is obtained when growing conditions are ideal. Operational yield is obtained under real-world field conditions that are typically less than ideal due to abiotic (weather events, soil conditions, etc.) and biotic (pests, diseases, etc.) stress factors. In its report, UCS concluded that, currently, no available GM crop cultivar enhances intrinsic yields . Herbicide tolerance – the dominant trait in GM varieties by far – did also not increase operational yields. Hence, adoption was driven by other factors such as lower energy costs and more convenient weed control. Based on the data compiled, the UCS report  found that insect resistant Bt maize likely did increase operational yields approximately 7-12% where and when the target pest was a significant factor limiting intrinsic yields. 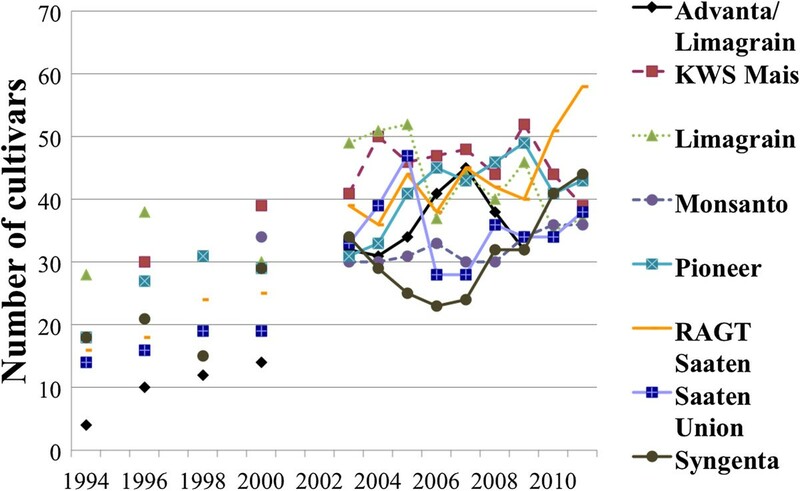 UCS concluded that yield increases prior to the introduction of GM cultivars and observed for the US and also throughout Europe are due to the successes with conventional breeding including the use of modern, molecular but non-transgenic techniques . In saying this, we acknowledge that yield is only partially a function of improvements in germplasm and all approaches that focus exclusively on changing genotypes are achieving lower marginal changes. For dramatic changes in yield and resilience in the face of climate change, a renewed emphasis on soil melioration and irrigation is required . However, an extended discussion on this is beyond the scope of this paper. The key point we are making here is that GM is neither the obvious way to increase yields nor is its introduction consistent with increasing agricultural biodiversity through cultivar diversity. We predict that it will be increasingly difficult in GM adopting countries to differentiate between what portion of a claimed improved characteristic of a marketed GM variety actually stems from genetic engineering and what from applying non-GM breeding techniques. Patent rights granted for GM varieties provide very strong incentives not to market the non-GM varieties but to add GM traits to any non-GM variety whether it actually contributes significantly to the advertised characteristics or not. However, this may not be unique to GM varieties as other similarly strong exclusionary IP rights instruments recognised by some countries may cause similar outcomes. These questions must and will be explored in further research projects in more detail. Farmers’ seed choice is not only based on the number of commercially offered cultivars but also on the diversity of cultivars in the national catalogue of varieties. In June 2002, the European Union decided on a common catalogue of varieties of agricultural plant species on the basis of the national catalogues. As Switzerland joined the directive on a common catalogue of varieties through an agreement with the EU in 2002, the four countries have access to a large number of registered varieties. In 2011, there were more than 4500 varieties registered in Europe, all tradable with the exception of GM varieties. However, the country-specific cultural value of seeds, e.g. their appearance on the national catalogues of recommended varieties, remain crucial for EU seed cultivars. Even though the opportunity to trade with EU registered varieties was used more frequently in the earlier years of implementation, country-specific varieties still make up the majority of all the offered varieties in the studied countries. It was interesting to note that locally-based seed companies/distributors were significant drivers determining the numbers of seed cultivars in Europe. Alternative breeding organisations also can increase farmers’ choice and seem to be increasingly popular in the three non-adopting countries that also tend to be those countries where organic production is growing most rapidly. In Austria and Switzerland, organic agriculture has now surpassed 18%i and 11%j of the agriculturally used area, respectively. Hence, efforts are now being made to breed cultivars for organic farmers’ needs. For example, the Germany-based multinational “KWS Saat AG”, which is a major breeder of GM varieties, has also established a successful organic breeding program and offers organic maize cultivars in Germany and Austria. In contrast, global corporations tended to have fewer varieties to offer. The few private seed breeders seem to limit the cultivar choices they offer in GM-adopting countries to GM seed cultivars endowed with private property rights in the form of patents while farmers in non-adopting countries continue to enjoy a similar or even increasing choice of seed cultivars. This trend was also noted by the US NRC  which stated that “research is needed to investigate the extent to which U.S. farmers are having difficulty purchasing high-yielding, non-GE seed.” and “… such market power [of the seed industries] could lead to decreased variability in the types of seed being produced for the market, as well as increased prices, which could limit the ability of farmers to purchase those seeds most suited for local environmental conditions.” At the time of writing this analysis, new reports confirm this concern. In the summer 2012, US farmers suffered from a drought of significant proportion. Additionally, farmers were hit by the fast spreading resistance in the target pest Diabrotica virgifera (corn rootworm) that rendered their presumed rootworm resistant GM maize susceptible to that pest, effectively compounding their problems from drought as this pest targets the root system. But the high adoption of GM maize now “left farmers without access to corn that doesn’t include the [Bt] gene” . Our internet research and data bank inquiries indicate that the lack of non-GM cultivars is being increasingly recognized as a problem in the USA and initiatives were started to develop, outside of the industrial sector, with small seed developers to breed and improve non-GM cultivars of soybean and maize again. For example, a few years ago, the “US Testing Network (USTN)” was founded by a group of independent seed companies and public and private maize breeders to test non-GM maize hybrids. Their declared goal is to “revive non-GMO maize seed breeding” and “improve the quality and quantity of non-GMO corn hybrids available in the marketplace” and “to help combat the lack of choice of corn genetics in the marketplace”k. Other initiatives range from internet websites that provide instructions for how to find non-GM seedsl, or the posting of books for download like “The nonGMO Sourcebook”m to organisations such as the “Ark Institute” that advertises on the internet to be “Your #1 source for 100% Non-GMO, Non-Hybrid seeds,…”n. 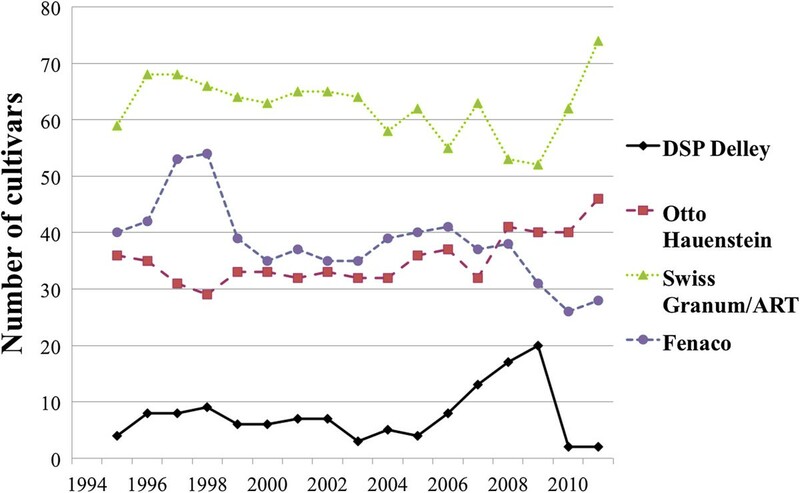 Our analyses of seed catalogues and registers of European maize varieties in non-adopting European countries showed that farmers have more maize cultivars available to them today than they had in the 1990s despite restricting GM-varieties. 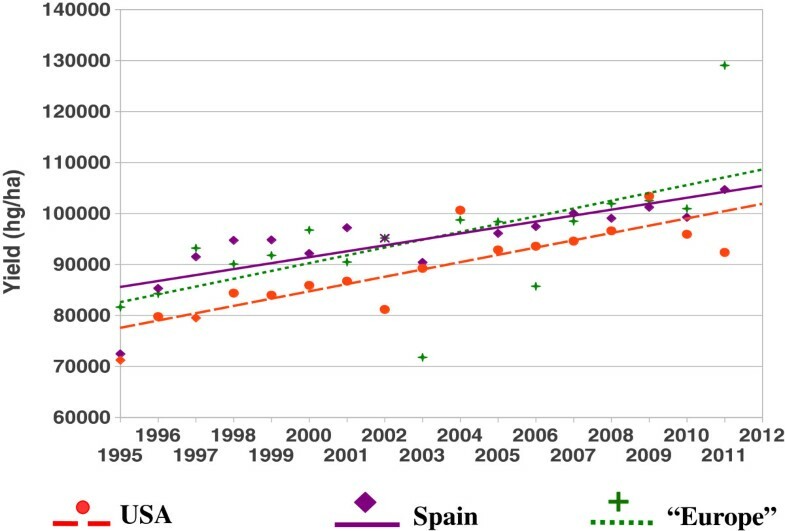 In Spain, however, the biggest GM-maize adopting country in Europe, came along with the increasing adoption of GM cultivars a decline in farmers’ choices of total numbers of available maize cultivars. This inquiry was an initial step towards understanding the dynamics and possible drivers behind the seed market for countries that adopt GM or non-GM crops. It also shed light on claims made regarding choice, competitiveness, and productivity. The results of our analyses open up a whole host of further questions that we intend to pursue in further research. For instance, what do our findings mean for genetic diversity and germplasm preservation for meeting future needs? To what extent are highly restrictive intellectual private property rights granted in the form of patents' driving the replacement of non-GM varieties with fewer numbers of GM varieties? In turn, how does this impact monopolization of the commercial seed market? The diversity of cultivars also provides choices relevant to local adaptation, and as a society, we are also interested in deeper choices that have long term effects on the resilience of the agroecosystem that farmers make explicitly or unconsciously. For those choices, farmers would need to have access to as much diverse germplasm as possible without legal restrictions. Farmers knowledge would need to be included into the breeding efforts so that cultivars would be developed that serve the farmers’ needs rather than the needs of seed industries. cAlthough the date when the Official Journal of the European Union is published varies from year to year, we compiled the data once a year (in December). eAlthough they adopt the legal form of cooperatives (i.e., farmers are members of the structure), but most of these cooperatives function like vertically integrated corporations. Significant decisions are made by a group of directors. Profits are usually not distributed among members but reinvested to increase the competitiveness of the cooperative/corporation . We were interested in learning how many cultivars of maize were available to a farmer over the years in the individual studied countries (Austria, Germany, Spain, Switzerland and total EU) since the introduction of genetically modified maize in Spain in the late 1990ies. Therefore, we evaluated the catalogues and registers of maize cultivars listed in Table 2 that provided us with a proxy for the choice of cultivars from a farmer's perspective in each country. The authors would like to thank various colleagues and farmers for inspiring discussions and insights into this highly complex matter. This work was made possible with own institutional support, no specific funds were provided for this work. The idea to the work, the supervision/guiding of students research and writing of the manuscript was in the responsibility of AH. TL and RV evaluated the seed catalogues of Germany, Austria and Switzerland and spoke to farmers, seed companies and seed distributors in Europe, RB provided the respective data and information on GM maize cultivars and production for Spain, JH compiled the information on maize productivity/yield and looked into patent issues as drivers behind cultivar development. All contributed to the writing and revising of the manuscript. All authors read and approved the final manuscript.